around the corner we couldn't not do a Valentine's Challenge! And just what we would like you to do ?? lost and won etc etc....these are just examples!! written or been written by you or others living or passed. A gorgeous layout. I love the spray of flowers and the combination of the colours. Beautiful. Great photo and love all the flowers and details! Thanks for playimg along with us at Shabby!! Love the colours and the beautiful flowers. gorgeous just ove all those flowers. Thanks ever so much for playing along with us at shabby. Such a pretty lo!!!! what a great pic!!! Thanks for playing with us at SHABBY!!! LOVE the heart and the flowers!!! I love the saying in the Title and your beautiful collection of flowers. What a beautiful bouquet of flowers!! The colour is exceptional!!! So fitting for your love note! 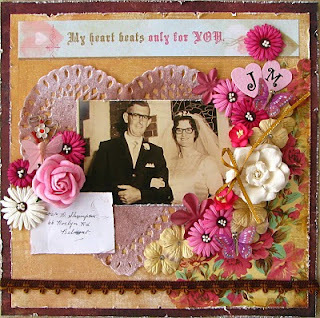 So pretty, love the pink hear doily. Great take on the challenge.